7am on 28 December, I nipped outside in the cold to check the animals were all ok and Lily, our Dexter cow, had started calving! I was so excited to be able to witness the first calf being born on our farm. I rushed indoors to tell Simon and armed with hot tea and the camera we watched as Lily very bravely gave birth to a beautiful calf. It was a text book birth, thank goodness, and was all over in about half an hour. Lily was amazing and knew exactly what to do. The calf was standing very quickly and suckling without any problems. 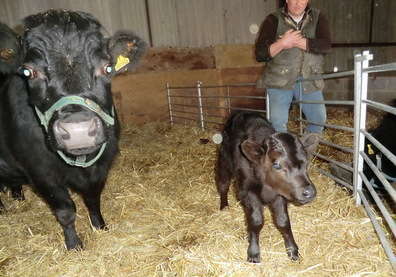 Lily is very proud of her calf and calls gently to it all the time. I could not believe he was trying to jump and play by the afternoon, nature is so amazing, what a fantastic day!